A duo of Japan's foremost Tsugaru shamisen performers, Oyama x Nitta, will perform for a Bluegrass audience at an upcoming concert presented by the Japan/America Society of Kentucky (JASK), the University of Kentucky Japan Studies Program and the Asia Center. The concert, part of the statewide Kentucky Cherry Blossom Festival, will take to the stage 3 p.m. Sunday, April 1, at Memorial Hall. The Tsugaru shamisen is a banjo-like instrument from the Tsugaru region in Aomori Prefecture in the northernmost part of Japan’s central island of Honshu. 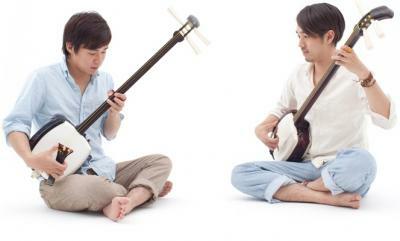 Oyama x Nitta is comprised of Tsugaru shamisen performers Yutaka Oyama and Masahiro Nitta, who are known for using the instrument to bring a modern sensibility to ancient, highly percussive folk music sometimes referred to as "Japanese bluegrass." Using an innovative approach to the traditional sounds of the shamisen, Oyama x Nitta performs classic and original scores with virtuosic improvisations that display the versatility of the instrument. The concert program will feature traditional music from Northern and Southern Japan and the elaborate, animated folk songs of Tsugaru as well as original music by the artists. To see a performance of "Karma" by Oyama x Nitta, visit YouTube at: http://youtu.be/GUf8lEzOefk. Tickets for the Oyama x Nitta concert are $5 for students and $10 for the general public. To purchase tickets call 859-257-TICS, visit the UK Student Center ticket office, or visit the JASK website online at http://www.jask.org/. Pay parking is available across from Memorial Hall at the corner of South Limestone and Prall Street. Also, parking on the UK Campus, is open on Sundays. Established in 1987, JASK is a nonprofit, nonpolitical membership organization dedicated to promoting a better understanding of the business, cultural and social practices and customs of Japan and Kentucky. Headquartered in Lexington, JASK provides member events and services throughout the state. UK's Japan Studies Program is an interdisciplinary program that offers courses in Japanese geography, history, arts, sociology, environmental studies and anthropology. By studying Japanese language, literature and culture, UK students obtain a solid base to advance their explorations of Japan. The UK Asia Center's mission is to be a catalyst for educational and professional opportunities to engage with Asia’s peoples, cultures, heritages, geographies, languages, arts, sciences, economies and technologies.